Each month I will post a setup with various sequences to practice. I will post training sessions with my dogs running the sequences. I will post videos of teaching my pup Inspire distance. 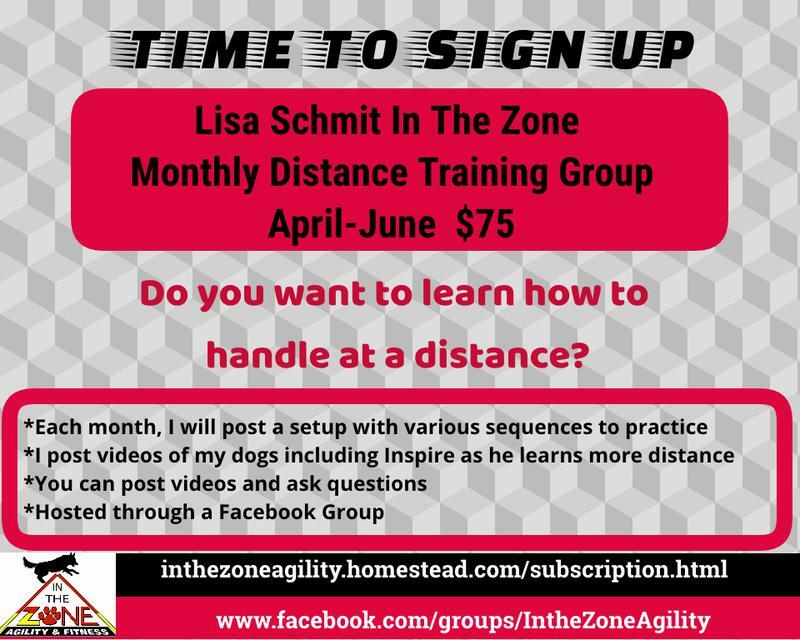 You can see how I train distance with a young dog as well as how I handle bigger distances with my advanced dogs. I won’t just post videos of my awesome dogs and runs :) I will post the actual training sessions with my dogs— including how I trouble shoot when I am having a hard time with a skill or sequence so you can see how to handle training challenges! With each setup, I will go over when to cue and what cues to direct your dog through the sequence. We will discuss your cues. What are you cues? Are they consistent? When does the cue need to happen? Are you on time? I will post my bonus runs -successful and my not successful bonus attempts to discuss what I did wrong or really need to train. Going to be a great class if you want to increase your distance skills. You can post videos of your training session and ask as many questions as you want. This class is hosted through facebook group. Cost: $75 for 3 month subscription. Email me at inthezoneagility@gmail.com for more info. Would you like to increase your distance skills? Are you having a hard time with classes with lines (Chances, FAST, Jackpot, Gamblers)? Are you interested in doing bigger distance such as distance challenges or bonus’? Are you ready to push for more distance?